The family Amphipsocidae includes 170 species in 17 genera with the center of diversity in Asia and Africa. 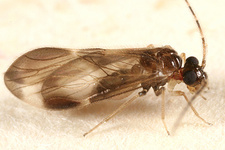 One species, Polypsocus corruptus, is known from North America. Amphipsocids are large-sized bark lice, 4-6 mm in length. They are known to inhabit broad-leaved, evergreen, and rainforest trees. Head: Vertex has a pair of concave areas. Forewing: hairs have distinctive pattern (see below). Hindwing: hairs have distinctive pattern (see below). Vertex has a pair of concave areas. Forewing has hairs on veins in 2 or more rows. Forewing has hairs on margin; they do on cross one another. Forewing membrane is usually hairless (occasionally with sparse hairs). Hindwing has hairs on margin and veins, membrane is hairless. Forewing areola postica is free from vein M.
Abdomen has 2 or 3 vesicles (inflatable sacs) on underside. Phallosome is closed, the tip has a rough texture. Hypandrium is simple, not ornamented, spine on free margin is small or absent. Subgenital plate lacks posterior lobe. External valve is absent or is a remnant at base of dorsal valve. Eggs are laid in groups and are covered by silken threads only. Large bark lice, 4-6 mm in length. Mandibles are large, insects look like their mouths are open. Abdomen has eversible vesicles (small inflatable sacs) on underside. Wings and body appear hairy. Hairs on veins are in 2 or more rows. Hairs on margin do on cross one another. Distal 1/2 of forewing has hairs on underside (ventral surface). Hindwing has hairs on margin and veins, but the membrane is hairless. 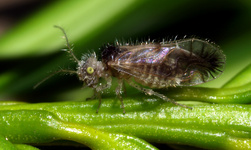 The monophyly of family Amphipsocidae is supported by two morphological characters: presence of a pair of concave areas on the head and distinctive patterns of the hairs on the forewing (see description above). Molecular data also support the monophyly of Amphipsocidae (4 genera sampled, 18S nuclear DNA; Johnson et al. 2004). Relationships within the family have not been studied using molecular techniques. Yoshizawa, K. 2001. Systematic study of Amphipsocidae in Japan (Psocodea: 'Psocoptera' Caeciliusetae), with comments on higher classification within the family. Insecta Matsumurana 58: 1-25.